Mike Garvey is a Consulting Partner, governance expert, and senior strategist with Ortus. He was previously a member of the FGI Europe team, where he specialized in advising directors and management of leading Canadian companies on a wide range of ethical and corporate governance matters. Garvey also serves as a corporate director on several public, private and not-for-profit boards. He has chaired the Audit Committees of three TSX-listed companies and served as Lead Director for one. 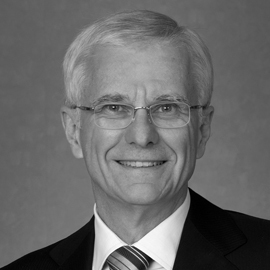 He has chaired the boards of the University of Waterloo, The Donwood Institute, The Michener Institute of Applied Health Sciences, The Friends of Ontario Universities, and Hospital Diagnostic Imaging Repository Services. He retired as a partner at a Big Four accounting firm in 2006. Garvey served as Managing Partner of the firm’s practice in Cuba for ten years. He was also the firm’s engagement partner for a number of significant multinational clients during his career. Garvey obtained his Bachelor of Arts (Honours Economics) from the University of Waterloo. He holds the professional designations of FCPA, FCA, and ICD.D.